Offering discounts is a great way to incentivize a purchase. You can offer your customers a monetary, percentage, or shipping discount for collections or specific products in your store. The most popular promotions are "Buy 2 - Get 1 Free" or "Buy 3 - Get 2 at 30% OFF", which you can create in Shopify. 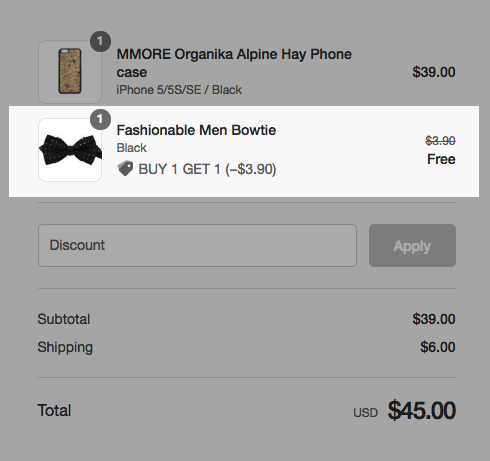 Using this feature you can easily create discounts that your e-shop visitors can use. You simply need to create a discount code and add information about it in the product description or promote in various marketing campaigns, so your customers are informed beforehand. Check out this article for the detailed steps. With the automatic discount feature, you can create Buy X Get Y discounts for your products or collections and get them applied automatically at the checkout. For more information about this feature and its functionalities, check out this article. Note: The discount is applied when both products (the one that the customer buys and gets for free/with a discount) are added to the cart. Do not forget to inform your e-shop visitors about the available discount offers directly on your product page, by creating a separate discount page, or by promoting it in various marketing campaigns.